Planting polymer (Hydrosource) is also Available from NCCD for $5.00 for a 12 ounce bag (enough to fill four 5-gallon buckets – and plant a lot of trees!). This polymer is also great for houseplants. Do you need weed barrier for under your trees? CLICK HERE for information. The 2019 Seedling Tree Order Form is available now. Orders are now being taken for receipt by the NCCD in May of 2019. As soon as the seedling trees are sorted, customers will be informed of the information necessary to come pick up their trees. The NCCD sold 6,400 trees to residents of Natrona County in 2018. Our nursery offers seedling trees from 18" to 6' tall with nicely developed root balls, perfect for starting a windbreak, shelterbelt or living snow fence. Natrona County Conservation District's Seedling Tree & Shrub Program provides affordable yet quality tree and shrub stock for planting effective living windbreaks and erosion control barriers in rural areas and on small acreages. Non-potted seedling trees cost between $1.00 to $2.20 per tree! Trees are sold in bundles of 10 or 25 depending upon the size of the tree ordered. The most up to date 2019 Order Form can be found HERE! Tree orders will be taken through April 15, 2019, for delivery in May of 2019. Please order early for the best selection! 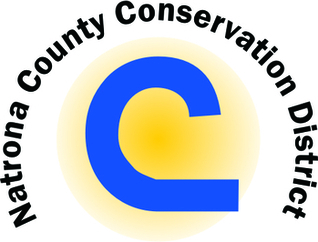 In May of 2018, NCCD sold over 6,400 seedling trees & shrubs for conservation purposes. While most trees and shrubs are sold as "bare-root" (as shown below), we do offer some potted species. These sell out quickly, so order soon! 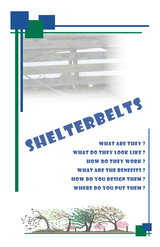 NCCD, with assistance from a Wyoming Department of Agriculture Grant, has published a "Shelterbelts" booklet. It has information regarding tree selection and how to design a shelterbelt, whether it is to be used as a living snow fence, a windbreak, or a wildlife or stock shelter. To download a copy, CLICK HERE. If you would like a hard copy, please CONTACT US and we will mail you one! Selection Information - The information links below were borrowed from other sites on the internet. In an effort to do the research for you, we have provided information on every species that we can order through our nursery in alphabetical order. The nursery has changes in availability of some species each year. Check the most up to date order form for availability! "Sweating" Information - Some species are best "Sweated". 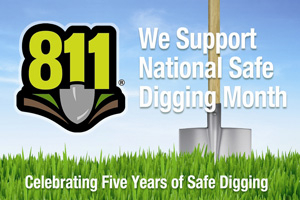 Dial "811" before you dig! Landowners/Operators are responsible for giving at least two work days advance notice to the Wyoming One Call system (800-849-2476 or 811) prior to any excavation project (including gardening, planting, fencing, etc). It is a free service to protect you from injury or costly damage to utilities (for which you can be held liable).